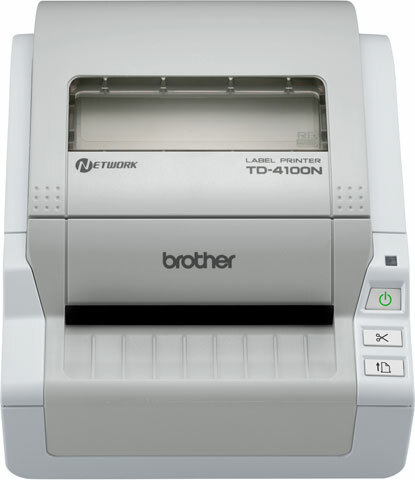 At a price of just a printer, the Brother TD-4100N is a complete barcode software and network label printing solution. 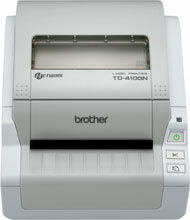 A true GDI desktop network printer, the TD-4100N is fully compatible with Windows OS computers, including Windows 7. This network barcode printer and label printer will print on most medium/high sensitivity direct thermal media in high quality 300 dots/inch print resolution, and comes ready with everything you need to start printing including the USB cable and PT-Editor 5, powerful but easy to use design software application. 12 Pack, 4"x1.97" (101.6 mmx49.92 mm) White Paper Lbl, 814/roll 4" x 2" label, 822 labels/roll, 12 roll case. 12 Pack, 4 in x 145.01 ft. (101.6 mm x 44.2m), White Paper Label 4" x 145" continuous, 12 roll case. 12 Pack, 2"x1" (50.8 mmx25.58 mm) White Paper Label, 1,544/roll 2" x 1" label, 1557 labels/roll, 12 roll case. 12 Pack, 3"x1" (76.2 mmx25.58 mm) White Paper Label, 1,544/roll 3" x 1" label, 1557 labels/roll, 12 roll case. 12 Pack, 4"x6" (101.6 mmx152.6 mm) White Paper Label, 281/roll 4" x 6" label, 285 labels/roll, 12 roll case.